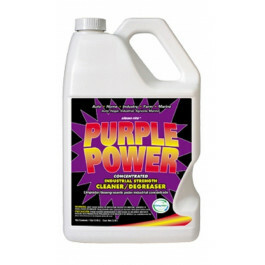 Purple Power 4315PS Cleaner, 128 oz. Purple Power Industrial Strength Degreaser works on a wide variety of surfaces in auto, farm, marine, home and industrial applications. Concentrated formula penetrates quickly and creates a barrier between the stain and the surface being cleaned. Certified biodegradable. Non-abrasive, non-flammable, and phosphate-free. Not for use on exterior car surfaces, glass, painted surfaces, or wheel rims. Not for use on exterior car surfaces, glass, painted surfaces or wheel rims.